﻿ A 52-year-old Female Who Is Dehydrated Postoperative Day #1 - Handling Inpatients - Resident Readiness General Surgery 1st Ed. Resident Readiness General Surgery 1st Ed. During your morning pre-rounds you see Ms. Yang, a 52-year-old female who is POD #1 from a small bowel resection for a high-grade obstruction. Ms. Yang states her pain is well controlled with medication but she feels tired and a little light-headed. In checking her postoperative orders you note she is NPO, her naso-gastric tube should be attached to continuous wall suction, and she should have IV fluids running. Although the NGT is in place and appears to be functioning properly, you notice on closer inspection her IV fluid tubing is disconnected. The patient tells you the tubing was bothering her while she was sleeping, so she disconnected it during the night. Her vitals reveal her to be mildly tachycardic and hypotensive with a heart rate of 103 and a blood pressure of 98/70. As you examine her, you notice her mouth and lips are dry and she is clearly dehydrated. Her wound dressings are clean, dry, and intact, and her exam is otherwise unremarkable. You realize the patient needs to be given fluids. 1. What type of intravenous fluid is most like plasma? 2. For each of the following types of fluid loss, what type of crystalloid solution is most appropriate and why? 3. What effect do crystalloids have compared with colloids on plasma volume expansion? On mortality? 4. Estimate the patient in this vignette’s maintenance fluid requirement. Assume she weighs 80 kg. Now adjust this estimate based on a 24-hour NGT output loss of 600 cm3. 5. If another patient, Ms. Bradford, was a cardiac patient with an ejection fraction of 31%, what precautions would need to be taken in administration of her maintenance fluid? 6. If Ms. Bradford was diabetic, should her maintenance fluid contain dextrose? 1. Table 42-1 summarizes the ion concentrations in the 2 most common types of crystalloid fluids—normal saline (NS) and lactated Ringer’s (LR). Note that the composition of LR most closely approximates that of plasma and is commonly used for surgical patients. However, because of the addition of calcium and lactate (bicarbonate) to this solution, it should not be used in certain clinical scenarios. For example, the calcium in LR can bind to certain drugs including amphotericin, ampicillin, and thiopental and reduce their effectiveness. Preclinical studies have also shown that calcium can bind to the anticoagulant in donor blood and promote clot formation; therefore, in clinical practice many centers do not infuse LR simultaneously with red blood cell transfusions. There are no clear contraindications to the use of NS. However, it is important to know that the high chloride concentration of this solution can lead to a non-anion gap (hyperchloremic) metabolic acidosis if large volumes are infused. Understanding the tonicity of various crystalloid fluids is important when deciding what to use for resuscitation and for maintenance. Both NS and LR are isotonic fluids, meaning the osmolar concentration of these solutions is the same as that of the interstitial space. Infusion of isotonic fluids into the vascular space results in diffusion of the fluid until it is evenly distributed among all of the fluid compartments of the body. About 1/3 of the total volume of infused isotonic crystalloid stays within the vessels. Isotonic solutions can be used for resuscitation or for maintenance. Hypotonic solutions (eg, 0.45% NS), in contrast, have a lower osmolar concentration than the intracellular and interstitial space. As a result, more of the water leaves the intravascular space in order to achieve osmolar equilibration with the interstitium. Because the water in hypotonic crystalloid leaves the intravascular space more rapidly than isotonic solutions, hypotonic solutions are never used for resuscitation. They are commonly used for maintenance fluid administration, as the insensible losses they are meant to replace are typically hypotonic in nature (ie, more water is lost than solutes). 2. The most appropriate crystalloid to use for losses from the gastrointestinal tract depends on the area of the loss—each portion of the GI tract has a different electrolyte composition. Replacement should be chosen to match, as closely as possible, the composition of those losses (see Table 42-2). 3. Crystalloid fluids are those fluids that contain only water and dissolved salts. Colloids are fluids that contain water and larger molecules or even cells (eg, albumin, packed red blood cells). Crystalloid fluid contains only small molecules, and they distribute freely throughout the extravascular space. As discussed above, when crystalloid fluids are administered, the interstitial volume expands more than the intravascular plasma volume. In contrast, the large molecules and/or cells in colloid fluids do not diffuse readily between body fluid spaces and remain intravascular. This creates an osmotic pressure that attracts water and thereby preferentially expands the intravascular plasma volume. For this reason, conventional teaching suggests 3 L of crystalloid solution is required to obtain the same incremental increase to plasma volume obtained with just 1 L of colloid solution. For those situations in which a patient cannot tolerate large volumes of fluid, colloids (albumin in particular) are widely used. While the theoretical basis for this practice may be sound, there are no clinical trials that have demonstrated any difference in outcomes when using crystalloid or the most commonly used colloid, albumin. For example, the Saline versus Albumin Fluid Evaluation (SAFE) study showed that the type of fluid administered (colloid vs crystalloid) conferred no survival benefit in critically ill patients. The uncertain evidence combined with the significantly higher costs of colloid solutions suggests that crystalloid solutions should continue to be preferred over albumin for most routine clinical situations. 4. The “4-2-1 Rule” is a quick way to estimate volume replacement (see Figure 42-1). Figure 42-1. 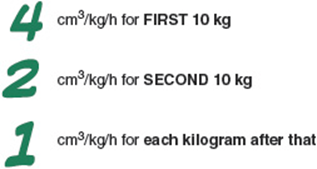 4-2-1 Rule for estimates of maintenance fluid requirements. In clinical practice the maintenance fluid requirement is then often adjusted based on the estimated quantity of other losses. For example, patients with high NGT outputs often receive 1 cm3: 1 cm3replacement for their NGT fluid losses in addition to their maintenance fluids. For Ms. Yang, this would mean receiving a 600 cm3 bolus in addition to her 120 cm3/h maintenance fluid rate. The 600 cm3 loss can also be added incrementally over 24 hours (600 cm3/24 hours = 25 cm3/h + 120 cm3/h = 145 cm3/h maintenance fluid rate). It is important to note that the “4-2-1 Rule” provides only an estimate and that estimate should be used for initial maintenance fluid administration, not to calculate resuscitation requirements. When the formula is used to calculate initial maintenance rates, adequate volume replacement must still be continually reassessed. The goal of adequate volume replacement, as discussed in the chapter on Shock, is to optimize preload and thereby optimize cardiac output and end-organ perfusion. For this reason, urine output (a measure of renal perfusion) is often used to determine when adequate volume replacement has been achieved. It should be maintained at least to 0.5 cm3/kg/h. 5. Certain patient populations require special attention when being resuscitated postoperatively or when calculating maintenance fluid requirements because they have increased risks for volume overload. Patients with poor cardiac function or patients on dialysis are especially susceptible to this complication. Oftentimes in clinical practice these patients receive fluids based on ideal body weight (IBW) that adjusts body weight based on height. One of the first signs of volume overload is weight gain. The excess fluid can also cause swelling in the extremities manifested as peripheral edema. Excess fluid can also enter the air spaces of the lungs and compromise oxygenation leading to shortness of breath. This can manifest as crackles on physical exam. Finally, when fluid overload is significant, there may be cardiac compromise in the form of arrhythmias such as atrial fibrillation or the development of congestive heart failure. 6. Diabetic patients are another patient population requiring special caution when IV fluids are being administered. Because this patient population receives exogenous insulin to control blood glucose levels, extra care must be taken to avoid hypoglycemia when patients are NPO. Adding dextrose to the maintenance fluid of diabetic patients ensures they do not “bottom out” their blood glucose levels. Furthermore, just as with nondiabetic patients, small amounts of dextrose help prevent the diabetic patient who is NPO from going into “starvation mode” and entering a catabolic state. Both NS and LR are isotonic crystalloid solutions. LR solution is similar to plasma in electrolyte composition (ie, it includes potassium, bicarbonate, and calcium). Isotonic solutions are used for resuscitation. Hypotonic solutions should only be used as maintenance fluids. Crystalloid solutions redistribute more into the interstitial and intracellular space, and colloid solutions remain in the intravascular space. The “4-2-1 Rule” is used to estimate maintenance fluid requirements. Care must be taken to avoid volume overload in susceptible patient populations such as cardiac and dialysis patients. Dextrose should be added to the maintenance fluid for diabetic patients who are NPO to avoid hypoglycemia. Urine output is 1 indicator of adequate cardiac output and hence of adequate volume replacement. 1. Which acid–base disturbance can occur with large-volume infusions of NS? 2. What is the appropriate solution to use for large intestine (diarrheal) losses? 3. To obtain the same theoretical increase in plasma volume, what ratio of crystalloid to colloid solution is needed for 0.45 (ie, 0.5) NS compared with albumin? 1. D. Non-anion gap metabolic acidosis results from the large infusion of chloride ions. 2. A. The large intestine has a high potassium concentration and so this is the electrolyte that needs to be replaced with diarrheal losses. LR contains potassium, but NS with added potassium can also be used. 3. C. 0.45% NS is also known as 0.5 NS. Since it is half the tonicity of 0.9% NS, you must double the 3:1 ratio described above.